School is over and my time here in Romania is quickly coming to a close. 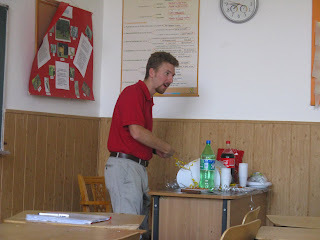 Unfortunately, I won’t be teaching English at Brediceanu next year. It is amazing how fast the past two years have gone! I can remember my arrival in Lugoj like it was yesterday. However, now it’s time for me to go home, to see family and friends, and return to the life that I left behind in the States. Living here for the past two years, I’ve had opportunities to see and experience things that I would have never had anywhere else. I’ve met people that have become a big part of my life, and will remain my friends long after I leave. Above all, I’ve made numerous lasting memories, and even if I have to leave, I can always fondly remember my time here with friends, colleagues and students. As one might expect, after living in Lugoj for 28 months, the town has become like a second home for me, which makes it all the harder to leave. Even while living abroad for such an extended period hasn’t always been easy, I’ve really enjoyed the experience. I’ve learnt so much about Romania, its people, landscape, food, and culture. Two years ago, if someone had asked me what sarmale were, I wouldn’t have had a clue. I wouldn’t have had any conception of the beauty of the Carpathian Mountains, or the grandeur of the Danube. I wouldn’t have known about Banat’s long, rich history. I’ve come to discover all these things and so much more. I’ve also learned quite a lot about everyday life in Romania, the good things and the bad. For example, I’ve had to deal with Romanian bureaucracy on more than one occasion, I’ve seen signs of corruption, witnessed how people trash nature, and I’ve become quite acquainted with just how bad roads can be. Romania, like anywhere, has its problems, and even while my experience here has been difficult at times, there have been countless happy moments. Moments like my first Christmas in Romania, when many of my friends and colleagues invited me into their homes and made me feel so welcome. I’ll also never forget last summer when a good friend took me to the village to teach me the ancient traditions of making hay and distilling tuica. Above all, I’ll always cherish the moments I had with my wonderful students. I’ll miss them, and I wish them all the best in the future! I came here as a volunteer not only because I wanted to experience another part of the world and learn about a different culture, but also because I wanted to do something good for others. People often ask me, ‘Why would you be a volunteer? You don’t make any money!’ or, ‘Isn’t it hard to leave home for such a long time?’ And while, yes, it has been difficult to be away from my family for 2 years, and I haven’t made much money, the most important thing for me has always been the experience itself. Volunteerism is perhaps more common in American culture than it is in Romania. It’s something that I’ve been doing ever since high school, and will probably continue for the rest of my life. For me, it’s important to be involved in society at large, to do something for the community in which I live. Volunteering is a great way to achieve these things. After all, a volunteer does his work not for himself, but to help others. This concept is an essential part of the ‘American spirit.’ But, I don’t think volunteering is something specific only to Americans; my students here have demonstrated to me a great desire to do good. I hope they foster that, and continue to act on it as they grow to become productive members of society. I leave Lugoj on 28 August. It honestly pains me to go, but I won’t be gone forever. I promise to come back for a visit. I thank the town of Lugoj for everything it has shown me, taught me and given me. It’s been a great run. Farewell to all those who made it so! On Tuesday, June 9th I went to Timisoara because Jeri Guthrie-Corn, the current US Charge d’affaires for Romania, came to give a talk on current diplomatic relations between Romania and the US. The basic gist was that Romania is one of the US’s closest allies in Europe. The most recent example of this is that Timisoara was chosen as the location for a refugee transfer center, a temporary holding site for displaced people and victims of political crime from around the world. After her talk, Ms.Guthrie-Corn went out for a coffee with the Peace Corps volunteers and Fulbright scholars from the Timisoara area. Cameron and I were the only Peace Corps volunteers to show up. And, taking pity on us Peace Corps volunteers, she gave us 50 lei for “a sandwich.” We both appreciated her gesture, and gladly accepted. It appears that Ms. Guthrie-Corn will relieved of her duties as acting ambassador when Mark Gitenstein (President Obama’s newly-confirmed appointee) comes to Bucharest on August 20th. As I mentioned above, the school year officially ended on June 12th with a final awards ceremony. In the last few days of classes my students showered me with gifts. One of my 9th grade classes even threw a surprise party for me! When I walked into the classroom, I found they had decorated the blackboard with balloons and chalk drawings that said "we'll miss you." There was a cake on the teacher's desk, on which they'd written "we won't forget you." I was touched by how much thought they'd put into everything. They even gave me a custom-made t-shirt with each of them represented as South Park characters. Quite cute. Notice how they decorated the balloon in the upper right! In the last week of school the 12th graders took part in the traditional ‘serenada,’ in which each of the senior classes sang songs to the teachers. They used well-known tunes but wrote new lyrics in which they alluded to moments from the past four years and made jokes about teachers and classmates. After all the singing was over, the students gave flowers and gifts to their favorite teachers. In fact, it’s quite common for students to give flowers to their teachers throughout the school-year or at any major school function. The following day was the 12th grade ball, which is sort of equivalent to a senior prom in the States. One difference, however, is that the students don’t necessarily go with a date; instead they tend to go as a whole class. Also, all their teachers come and mingle. And furthermore, the party goes on foreveeer. We didn’t even eat dinner until 1am. H’orderves were served at 10, followed by dancing, then more food and then more dancing. There was also the ritual in which the students formed a line and went from teacher to teacher to kiss them and toast with champagne. By the time the school director and mayor gave their speeches and the dessert was put out, it was nearly 3am. In the end, I got home at about 9am, completely exhausted. The week after school ended, I went on a small tour of Transylvania. I stopped in the town of Reghin (famous for the manufacture of string instruments) to visit Alayna, a fellow Peace Corps volunteer before she left Romania. Cherries were in season, so we ate our share. After that I went to the city of Targu Mures (pronounced ‘Tirgoo Mooresh’) to help Mikey (another volunteer) with and English camp in a neighboring village. After the camp there I headed north to Sighetu Marmatiei (the second part of that name is pronounced ‘Marmatzi-eh’), which is a town in Maramures right on the Ukrainian border. My friend Julie had organized a series of Klezmer workshops throughout Romania, one of which being in Sighet. So, I decided to go check it out. It was basically a weekend of Jewish cultural events that Julie had organized with the help of local community members and some klezmer artists from NYC. I had the opportunity to sit in on a prayer service at the synagogue, which I had never done before. After the service, everyone was invited into the community center for drinks and refreshments. There was dancing and singing, and of course, tuica. It was my first experience with such Jewish-Romanian traditions. In fact, it was probably the first time in years that some of the old-timers there had the opportunity as well. It was great to see everyone participating with such fervor. But, at the same time it was also sad to realize all of this was just a faint glimmer of a past life. Even while the Jewsih community in Sighet is still relatively large by Romanian standards, it’s only a shadow of what it once was. However, I think the local community so eagerly seized onto the whole thing simply because it revived something of a bygone era. Sighet is the hometown of Elie Wiesel, and while I was there I took a moment to go see his childhood home. After having read Night—the book he wrote about his experience in Nazi concentration camps—it was interesting to see first-hand the places and things he had mentioned. The weekend program also included some musical performances, which unfortunately I had to miss. However, I did have the chance to hang out with the artists during their rehearsals at the hotel. They played many klezmer tunes which were actually written in Romania, but have since been all but forgotten around these parts. Incidentally, at dinner that night we went to a restaurant and heard quite a few traditional folk songs, some of which the musicians from New York said sounded strongly influenced by klezmer. I thought that was pretty fascinating. Since Ukraine is literally just a hop skip and a jump from Sighet, a couple of us decided to cross the Tisa river and spend an afternoon in the first town we found, just so we could say we’d been there. 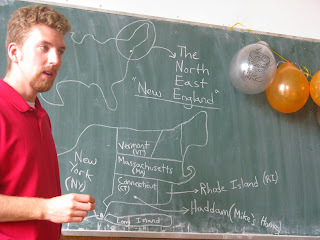 Shaun, a Peace Corps volunteer serving in Ukraine, happened to be one of our party. He spoke Ukrainian quite well, which helped when dealing with the border guards. We passed through passport control and continued on until we reached the village of Slatina, a settlement no more than a kilometer from the border. I remember noticing numerous individuals on the road at the edge of town, stuffing cigarettes down their pants, in their bras, or hiding them somewhere in their car or motorcycle. Apparently smokes are considerably cheaper in Ukraine, so people smuggle them into Romania. As a town, Slatina didn’t seem all that different from any small town or village in Romania. In fact, there were quite a few Romanians, and just about everyone spoke the language. We stopped at a bar to try a beverage called kvass. It’s essentially a mildly-alcoholic drink made from old rye bread and sugar. It was dark and bubbly and wasn’t all that great, a little like drinking stale coca-cola. But hey, at least I gave it a try. I took a very uncomfortable train back to Lugoj from Sighet. Arriving at 6am, after 12 hours and no sleep, I went home and took a nap. At 10am I got up and went to Clubul Copiilor to help with the ceramics camp (the same one that I helped with last year). We had about 35 kids this year. Ole came back to Lugoj for the camp, and brought with him friends from Denmark and Norway, and, of course, lots of clay. My main function this year was to act as translator between the Scandanavians and Romanians, and I taught the kids how to make clay whistles. After the ceramics camp, I made another trip to the National Archives in Timisoara. You may recall my ill-fated experience there in March. I went back because the documents I was after had been returned from Bucuresti. 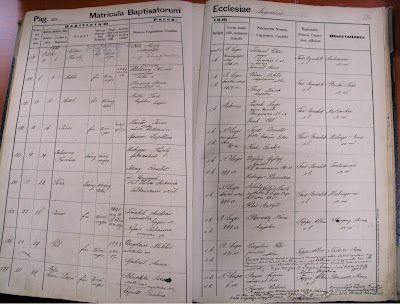 Thus, I was finally able to access the church registry with Bela Lugosi's birth records. It documented his address as "Nemet Lugos, 6 Szemely" which means Nr. 6 German Lugoj (Lugoj used to be split into two halves, German and Romanian, demarcated by the Timis river). Unfortunately, no street name was specified, which was something I hadn't anticipated. I looked through the registry for other kin, hoping the address would be more specific in another entry. I found record of his sister Vilma's birth in 1878. But alas, the address in her entry wasn't any different. Digging a bit deeper, I also found his father's death records. Curiously enough, his address was entered as "Templom Utca 7 sz." (Nr. 7 Church Street). So, at least there was a street name--the same street I was expecting--but the number was on the opposite side. Perhaps this was the address of the place where he had died, not his home address? Puzzled but still happy that I had managed to track down these records, I asked to take some pictues. Non-flash photography is permitted as long as you pay the 7-lei fee. I was happy to pay the fee, and reached for my wallet. Seeing this, the lay said, "oh no no, you can't pay here; you have to pay at the National Treasury or at the post office." I should have known this would be the case, but for some reason I had forgotten how bureaucratic things can be. I ended up having an argument with the lady for about 20 minutes about how incredibly inconvenient and ludicrous the system is. 'Why can't I just pay you here? ', I inquired. In the end I discovered that it wasn't the money that was important, it was the receipt that I'd receive after putting the money in their account. Without that one slip of paper, I couldn't get anything done. I realized there was no working around it, so I gave in. After numerous trips between the archives and the post office, hours of waiting in line and discussions with the Timisoara postal director, I finally got the coveted receipt. Returning with it to the archives, I finally managed I take the pictures I wanted. Phew!! It was quite frustrating to think that I had to jump through so many hoops just so I could take 5 pictures (a task that took no more than minutes in itself). Now that I have copies of the records, I'm going to give them to the Lugoj town hall so they'll have them for their archives. I hope they'll be helpful in the future for putting a plaque on Lugosi's house. Next I went to Denmark with Martin for the Roskilde music festival, which took place just outside Copenhagen. After being in Romania for the last two years, I was a bit bowled over by Copenhagen. I didn’t expect it, but I was really impacted by little things here and there, like highways, or the prevalence of bicycles, or the fact that trains and buses run on time. Perhaps this was a little preview of the culture shock I might face in returning to the States. But anyhow, Denmark was incredible. I was really impressed with life in Scandinavia--precise, clean and elegant. The festival itself was amazing; I saw so many bands and met heaps of cool people. I came back to Romania in time for the end of the year “campus” at the kids’ center in Mondial. It was essentially a summer camp; we sang songs, played games (like tug-of-war or water-balloon toss, etc.) and organized arts and crafts activities. It was my last time with the kids, and I’m glad things ended on a good note. The center is run by a group of Italian nuns, and they always invited me to their place for lunch after we finished the camp activities for the day. Needless to say, I ate very well that week. Then I went to Istanbul with my friends Chris, Eva, and Zach. Having just finished his service, Chris was flying home from Istanbul; it was actually the cheapest flight he could find. So, we all went together to see him off and spend a few last moments together. Since we had all been to the city before, we didn't need to do the typical touristy stuff. Instead, our focus was to spend some quality time with each other, eat some good food and just relax. Highlights from the trip included excellent kebab, a seabass lunch, haggling at the Grand Bazaar, and a scenic boat tour up the Bosphorous (probably the most touristy thing we did). The bubbling of hookahs characterized our trip, but perhaps just as defining was the rattle of rolling dice. At hookah bars throughout Istanbul all the old men spend hours smoking and playing backgammon. A bit curious at seeing this, we decided to try our hands at the game. It quickly became our favorite pastime. From Istanbul, Eva and I flew to London (turned out to be much cheaper for me to fly back to Romania via London than to fly direct from Istanbul). We stayed in East London with a couchsurfing couple who live in a townhouse with a garden out back. We shared many bottles of good wine, cooked a few great meals and engaged in some wonderful conversations. Eva and I also ate some Indian food at a restaurant on Brick Lane, drank some ginger beer, checked out the National Gallery, explored East London a bit and hung out in Victoria Park. Like in Denmark, I had some moments of shock and awe, especially going to a food market and seeing the sheer variety of goods that were available. I saw vegetables I'd never seen before, tasted cheeses I never knew existed. There were stands with local ciders and beers from all over the world. I ate a fresh blueberry muffin (hadn't had one of those in two years). As I strolled by a little chutney kiosk, I surrendered to temptation and sampled the wares. There were other kiosks with Turkish delight, but I deemed it a little too early in the morning for that. They even had a stand selling ostrich meat! It seemed there was nothing you couldn't find. After coming back to Romania, I was struck by the realization that my time here is really running out, and perhaps I’ve made too many plans. I had promised to go to Cluj one more time before I leave the country, so I went last week to hang out with the Peace Corps volunteers still remaining there. Then I went to Targoviste (Turgoh-veesh-tay) to help with a training on peer counseling and stress management for group 26, the newest group of volunteers to come to Romania. As I write this, I’m at Zach’s apartment in Sibiu. We’re preparing to head out tomorrow to help Outward Bound with the Carpathian Adventure Race, a competition in the Fagaras mountains involving hiking, biking and rafting. It starts the 12th and finishes on the 16th. I’m not exactly sure what our role will be, but I have a hunch we'll be manning checkpoints along the trail. After the 16th, I'll have about 10 more days at site in which to say my goodbyes, wrap up loose ends, and pack all my stuff. 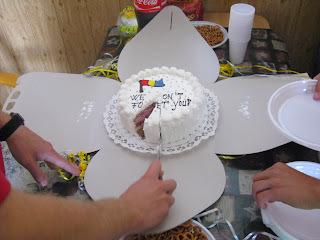 Then I'll head down to the Peace Corps office in Bucuresti to officially close my service as a volunteer. That may not seem like much when written down, but to be honest, I'm a bit overwhelmed by all the little things I have to take care of before I head home.